Possibly the hardest-working accent in your home, a kitchen island can provide a place to prep dinner, stow kitchen essentials, and offer a convenient spot to gather for charcuterie and cocktails. Even better? When you're struggling with a lack of space in the kitchen, it can be a genius storage solution and chic focal point. 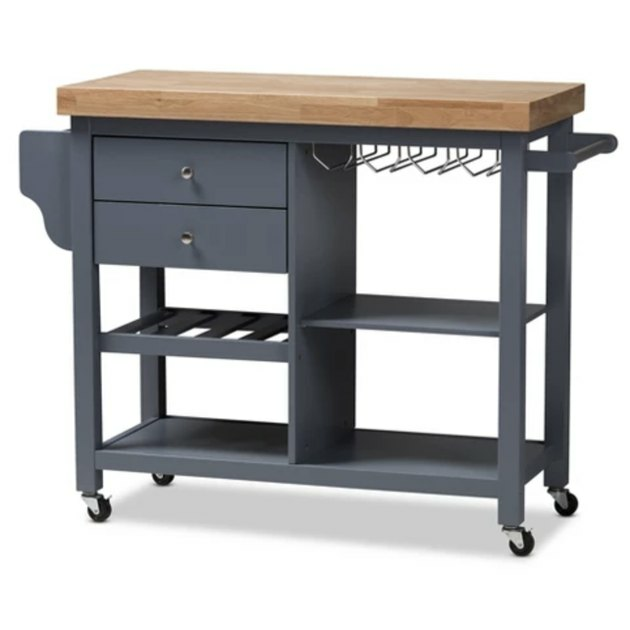 Here, the best kitchen islands and carts that will give you way more storage. 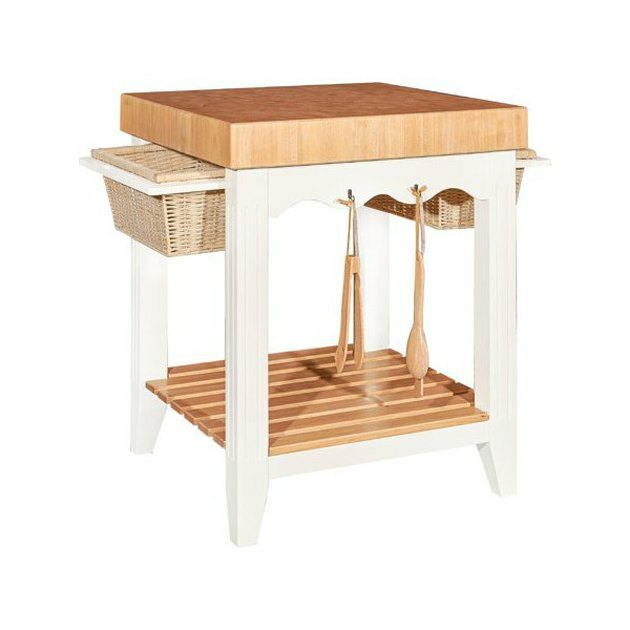 Perfect for city dwellers, this square kitchen island features a butcher block top, basket pullout drawers, a slatted shelf, and four utensil hooks. What's also great? It includes an accessory kit with spoon, spatula, and tongs that can be hung from leather straps, which give it a very Scandinavian feel. 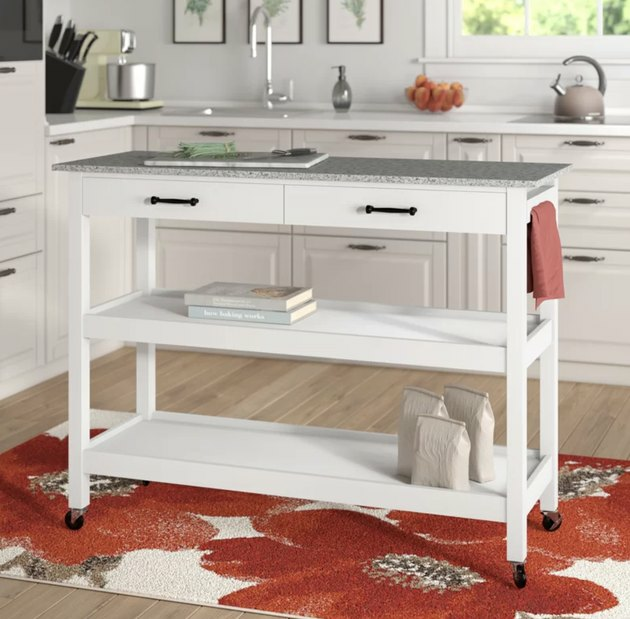 Functioning as both a kitchen and bar cart, this island boasts a solid rubber wood top, two drawers, four shelves, and a glass rack to ensure that you have all the extra storage and space you need whether you're prepping dinner or entertaining friends. The wooden top on this chic kitchen island doubles as a butcher block surface, while the drawers allow you to tuck away napkins, cutlery, and more. It also has a fully covered cabinet for housing essentials like mixing bowls or a spice rack. 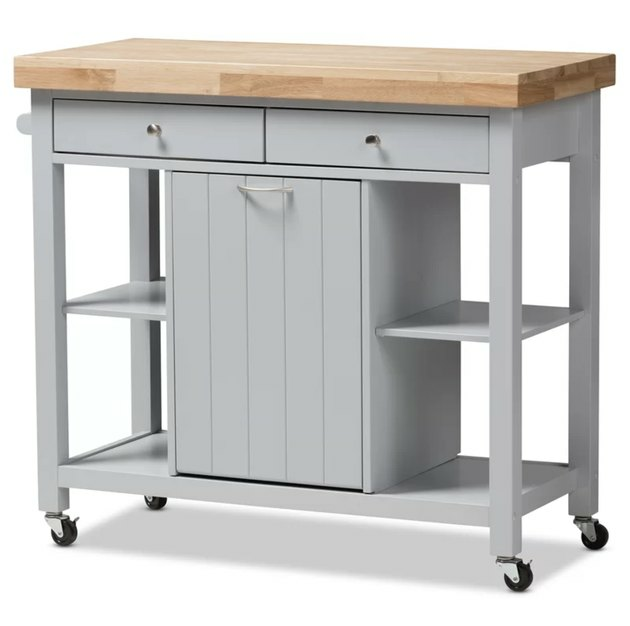 A simple storage solution, this kitchen island has a spacious wood top for preparing meals, a large drawer for storing kitchen utensils, and two lower shelves for holding essentials like cookbooks, serving pieces, and a standing mixer. Our favorite feature of this blue-gray island? The concealed garbage compartment that makes cleaning up a breeze. Everything has its place in this kitchen island. Hang hand towels and oven mitts from the hooks, store pots and pans in the large cabinet and small utensils in the drawer, and stack everyday dishes on the open middle shelf. 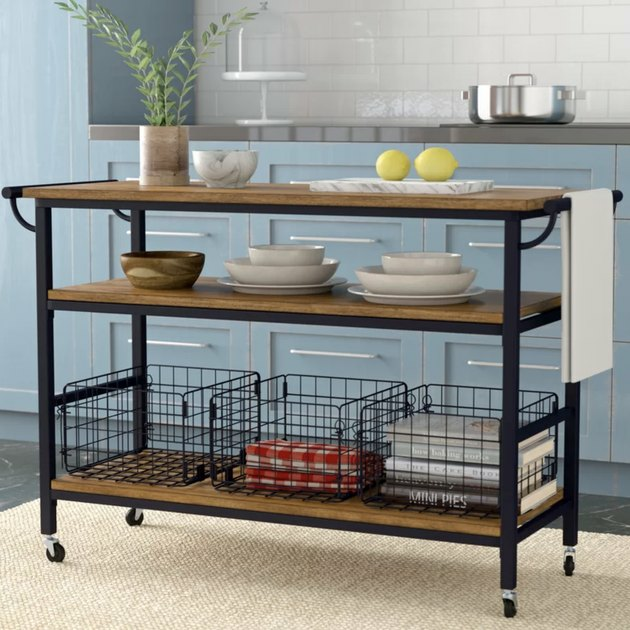 If you need extra pantry space, this industrial-inspired kitchen island with its rustic wood-and-iron frame has a large countertop and two lower shelves that can support up to 80 pounds of dinnerware, canned foods, and more. We love the removable wire baskets, perfect for housing cookbooks or fruit. 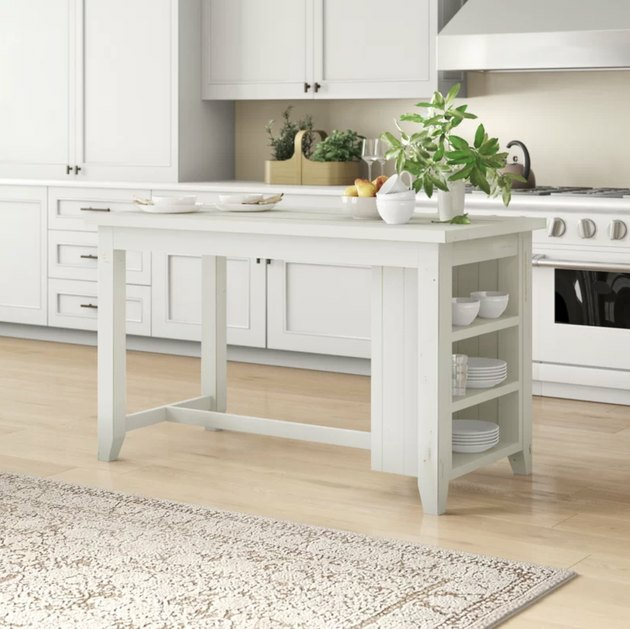 Great for prepping food, eating a quick meal, or gathering around with friends, this charming plank-style kitchen island — crafted from reclaimed pine finished in a crisp white — complements a farmhouse aesthetic, all while providing space to stow kitchen essentials or decorative accents. 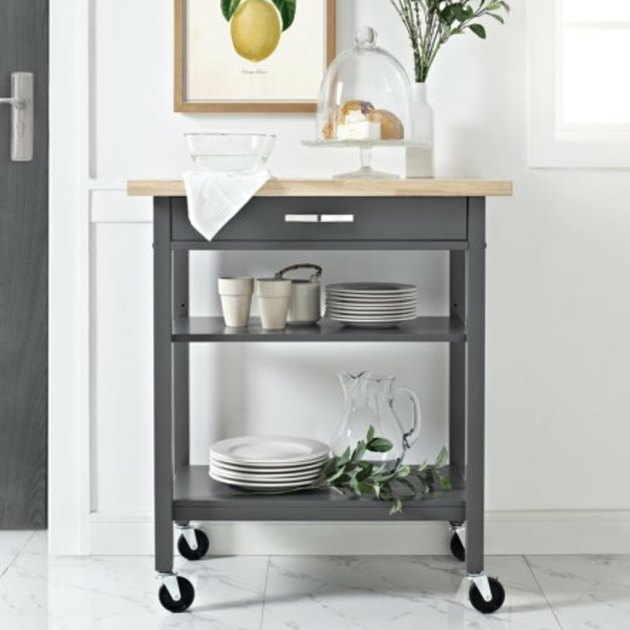 A sleek marble-topped kitchen island with lots of storage — what more could you want? Instead of feeling like a random piece of furniture in the middle of your kitchen, it'll fit right in and tie your room together beautifully. 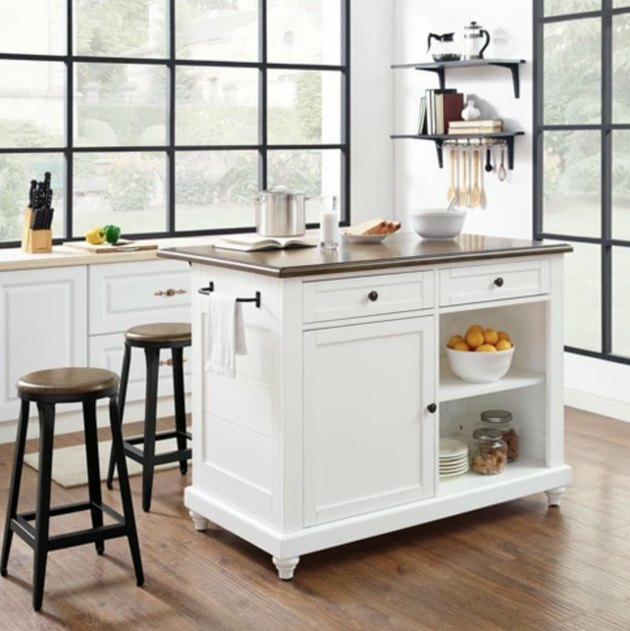 Country-inspired, this natural framed kitchen island features two drawers, two slatted shelves, modern black hardware, and a faux white marble countertop ideal for food prep and entertaining. Plus, caster wheels allow you to move the cart wherever it's needed. 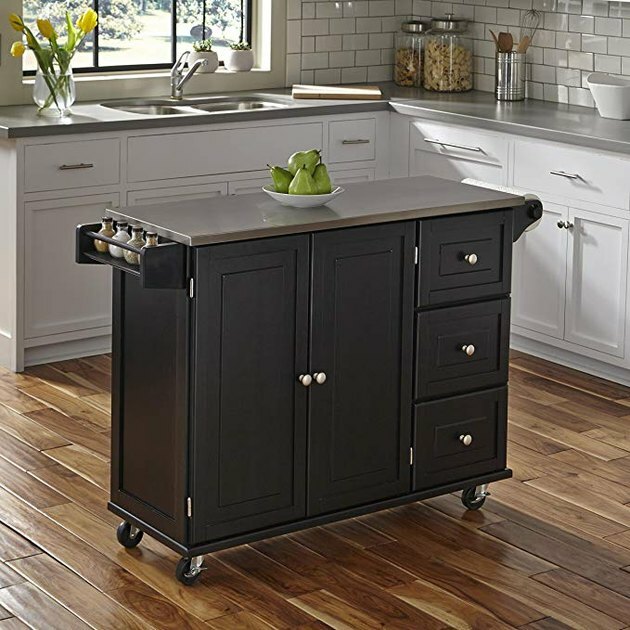 Whether you're short on storage space or just want a spot to lay out hors d'oeuvres when hosting friends, this matte black kitchen island acts as a catchall for your everyday items and as a serving station for your next gathering. 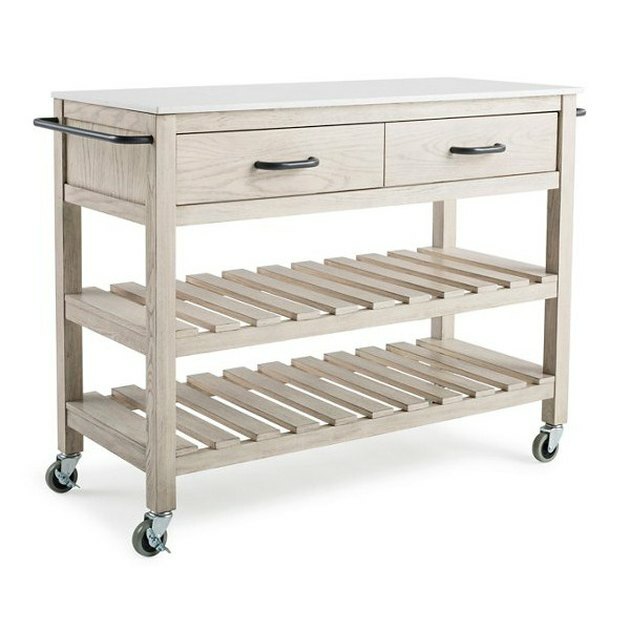 The bamboo top on this sleek island is a perfect work surface, while the drawers and shelves offer additional space to organize cooking essentials if you lack kitchen storage. 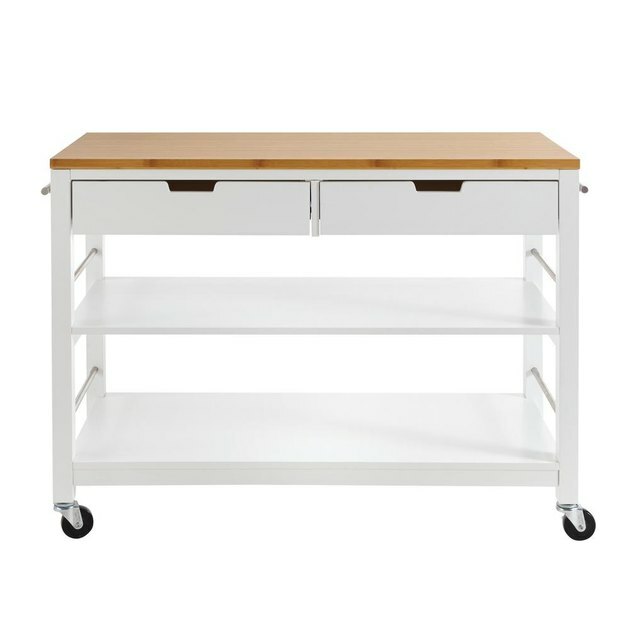 Outfitting a smaller space? 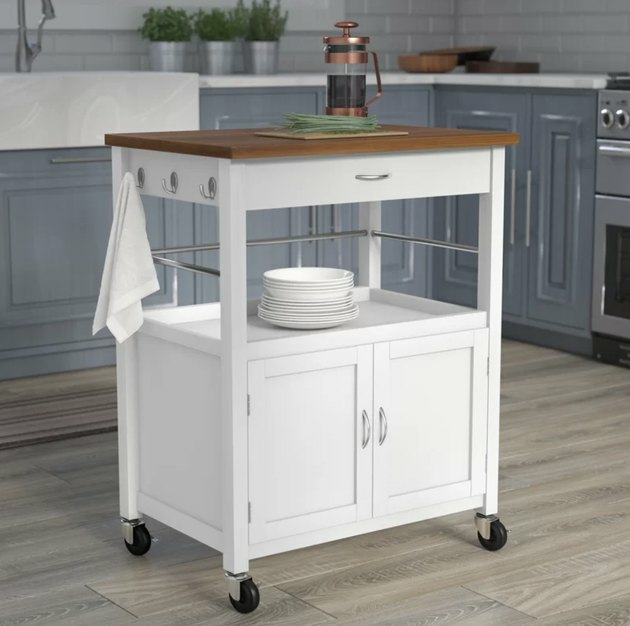 This compact mobile kitchen island gives you extra counter space as well as a drawer and shelves to help make organization a breeze. 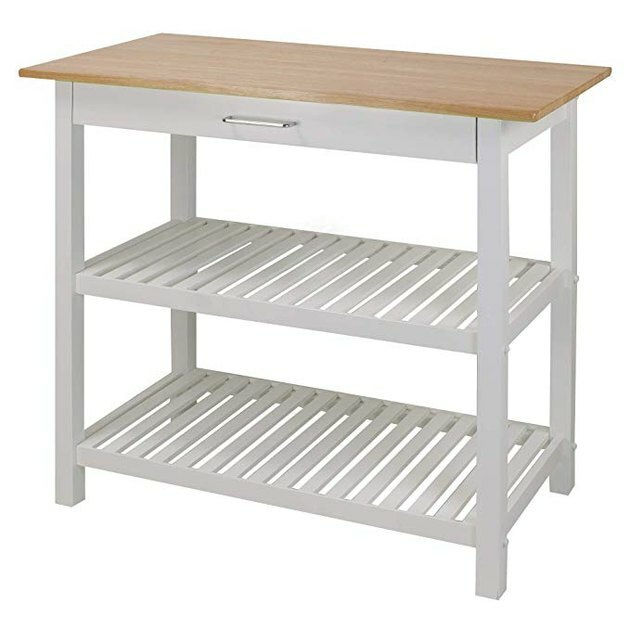 Pick from classic white or gray to seamlessly transition into any kitchen. 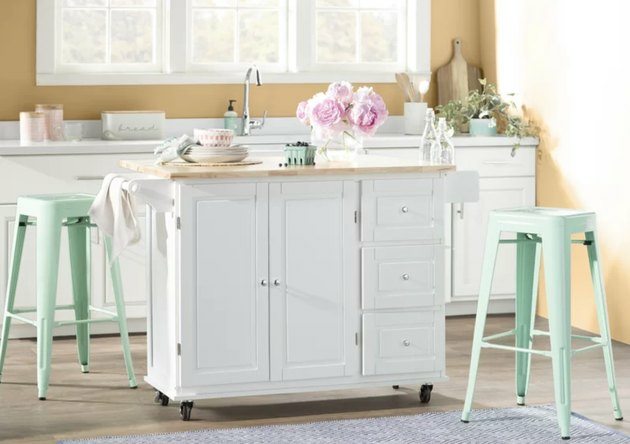 While it may feel like a splurge, this industrial- yet cottage-inspired freestanding kitchen island solves all your storage, workspace, and extra seating problems. Not only does it come with drawers, cabinets, and shelves galore, but also included are two black iron stools with wood grain tops that fit neatly beneath the overhang of the rustic, antique oak finished countertop.